A comprehensive course leading to AWEP CertificationTM that is designed to prepare physicians and other health care providers with an extensive background in key topics and practical skills needed to become a competent expedition, wilderness, or search and rescue medical provider. The conference has unique optional hands-on workshops on topics ranging from outdoor survival skills to practical wilderness medical skills. Small interactive groups with outstanding instructors. *Target Audience: Primary care physicians, nurses, physician assistants, and other health care providers who might encounter patients in remote settings or who may treat patients that develop medical problems after visiting remote areas. No outside commercial support has been received for this activity. 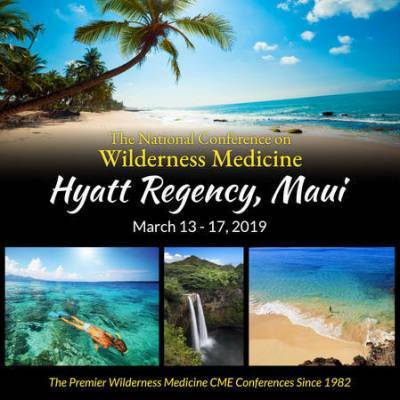 Speakers: ERIC A. WEISS, MD, FACEP: Professor of Emergency Medicine (Emeritus), Stanford University School of Medicine, Founder and former Director, Stanford University Wilderness Medicine Fellowship; Author of A Comprehensive Guide to Wilderness and Travel Medicine and Editor of Wilderness and Environmental Medicine in the 2017 Clinics of North America., KYLE ALLRED, PA-C: Professional Expedition and Whitewater guide; Has guided extensively on five continents; Wilderness Survival Instructor; Co-founder of MedCram.com and MedWild.com., JOSEPH B. SERRA, MD: Founding Member of the Wilderness Medical Society; Orthopedic Surgeon, Stockton, California, 25 year member, National Ski Patrol, Rotary International to Africa., PHIL RASORI, MD: Medical Director of Village HopeCore International; Travel Medicine and Global Health Consultant; Assistant Clinical Professor of Medicine, UCSF., KAREN VAN HOESEN, MD, FACEP: Professor of Emergency Medicine, Director, UCSD Diving Medicine Center and Dive Medicine Fellowship, University of California San Diego School of Medicine, San Diego, CA., SHERYL OLSON, RN, BSN: Outdoor Survival and Navigation Instructor, Former Flight Nurse in the Rocky Mountains for 18 years, Wilderness Safety Instructor, Cruise Ship Nurse., BRIAN HORNER: Director and founder of LTR Training Systems, Inc. - A multi-discipline training institution with programs in fall protection, aviation safety, remote medical response and rescue for over 30 years. Former Military SERE (Survival, Evasion, Resistance, and Escape) Instructor., LANNY JOHNSON, FNP/PA: Physician Assistant, Jackson Hole, Wyoming; Medical Advisor and former Climbing Park Ranger and Park Paramedic, Grand Teton National Park, Wyoming., HOWARD J. DONNER, MD: Filmmaker/Physician/Guide, Member 1997 Nova Everest Expedition; NASA consultant; expedition physician, 1988 American Kangchenjunga Expedition; Medical Officer, Denali Medical Research Project; Certified Flight Instructor, Founding Co-Author of, Field Guide to Wilderness Medicine.